In 2015 the graduate school of agriculture and life sciences initiated Scientific Network program with the aim to organize the seminars hosted by the students to benefit all the members who are connected to the University of Tokyo. Since then the popularity of the program is ascending with the quality of the lectures. This time again on January 8, 2019, we the students, involved in the program, are going to host the seminar 'Cell Cycle Control'. We all know cells division take place in plants, humans, bacteria etc. but back in the time, people didn't know that how and when it happens. Scientists were putting their day and night to figure it out until Sir Paul Nurse discovered the cdc2 gene in fission yeast. The gene controls the progression of the cell cycle from G1 to S phase and the transition from G1 phase to S phase. 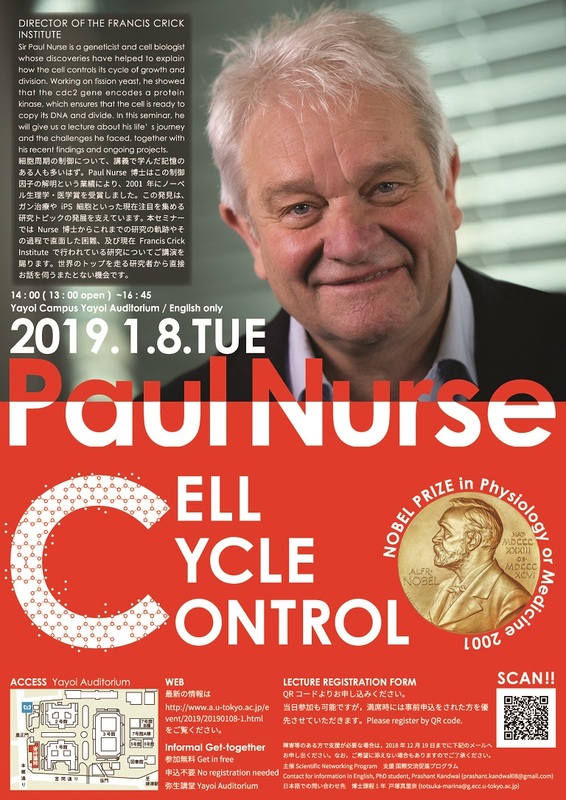 Sir Paul Nurse was awarded the 2001 Noble Prize in Physiology or Medicine along with Leland Hartwell and Tim Hunt for uncovering protein molecules involved in cell cycle control. In a path of great findings, one has to face countless challenges and if you get the opportunity to meet someone who overcame and achieved great success, we believe you should grasp the knowledge. We are honored to host Sir Paul Nurse, who is coming to our university and will give two lectures; First, will be about his life's journey in his scientific career. Second, will be focusing on his current ongoing research in his laboratory.